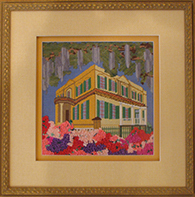 We take great pride in our custom framing creations. Our staff is always available to assist in designing the perfect framing choice for whatever you would like to frame. We use conservation quality mats and glass and have over 20 years of experience. As a partner representative of Larson Juhl we carry their entire line, as well as a number of other lines resulting in a vast selection of picture mouldings to choose from including fine water-qilded mouldings. Our work is done in house and our turn around time is typically under 2 weeks. We are happy to accommodate special rush needs. Come in for a custom framing consultation today! Signature mats for weddings, retirement, etc. Ever wondered what the different types of picture framing glass are? Here is a short and sweet guide with the basics! Regular Glass This is the most basic picture framing glass. It is clear with no protective coating. UV Glass This conservation glass is clear with a protective coating. Pieces framed behind this glass receive 97% protection from sunlight. This UV coating prevents fading and damage from natural or artificial light sources. Non-Glare Glass Non-Glare glass has an etched surface to diminish glare from lighting. Our glass is single-side etched. 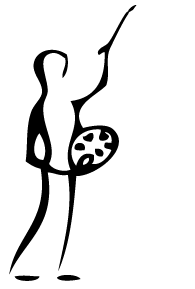 This results in a clearer glass than double-side etched. Museum Glass Museum glass is high quality clear glass with the highest UV protection rating. This glass also has an anti-reflective coating that makes pieces look as if there is no glass at all. This glass protects your piece without interfering with the viewing experience. 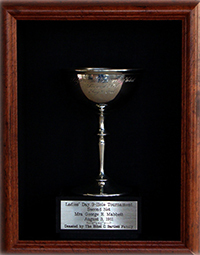 What are the reasons people have their special possessions custom-framed? Certainly framing allows these possessions to be enjoyed every day. Well-designed framing enhances the art and contributes to the decor of homes and offices. Plus, the proper framing provides protection for valued possessions. 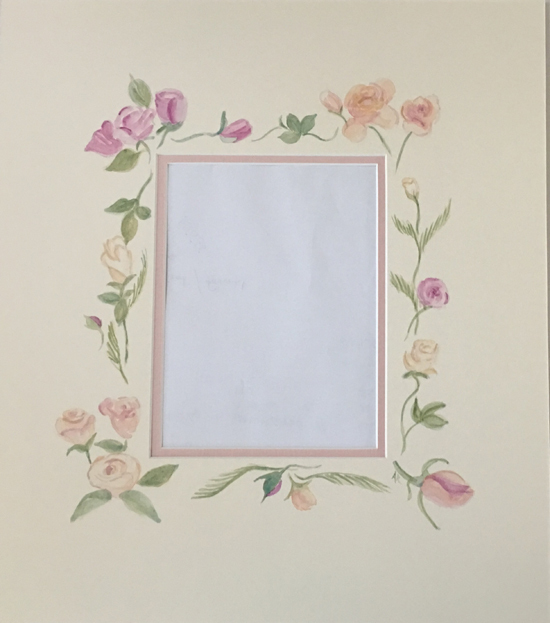 Two of these three reasons for custom framing are easy to see—the ability to display something and displaying it in a manner pleasing to the eye. The third benefit of the craft isn't so obvious. Most clients can't distinguish between conservation grade materials and materials that don't protect their valuables. Like most technology, advances in the conservation properties of the materials have happened quite recently. Most of the things we now provide clients were not available 15 years ago, and those from just five years ago aren't as effective as they are now. It is a our obligation as a professional to inform and educate you about the products and benefits that are available, like our acid free (neutral pH ) materials and glazing that provides maximum protection from fading while giving clients a crystal clear view of their piece. A shadow box is an enclosed glass-front frame containing an object or objects presented in a thematic grouping with artistic or personal significance. The grouping of the objects and the depth effect created by their relative heights from the backing creates a dramatic visual result. A shadow box is perfect for sports memorabilia like Sports Jerserys, balls, bats and clubs or military heirlooms like medals, awards, flags, even uniforms, or coin collections or anything three dimensional that you collect and would like to display. In the picture framing industry, a fillet (also referred to as a slip) is a small piece of moulding which fits inside a larger frame or, typically, underneath or in between matting, used for decorative purposes. The use of "fillets" in picture frames is wholly decorative. Fillet can be pronounced in two ways. 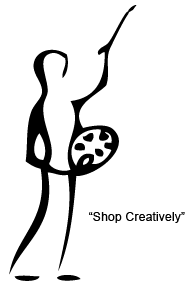 One way is to pronounce it as if it were "fill-it", as the similar term from mechanical engineering is pronounced. The other is similar to the French-derived culinary term. Either is acceptable in English, though most frame shops prefer one or the other pronunciation. Made from rigid, linen-wrapped beveled wood, linen liners offer a stately, elegant and sophisticated alternative to matting, both in function and appearance. Long used by professional framers to create depth and soften the transition between a wood frame and original paintings, linen liners are ideal for framing canvas without glass, but they can also be used above or below glass when framing art on paper. Enhancers are stacked inside the picture frame making the frame wider. 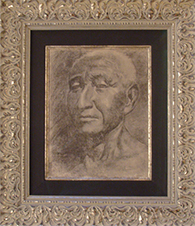 They come in a variety of styles, finishes and colors and are used as their name suggests to enhance the frame and the piece being framed. This is part of an old whaling harpoon that our customer wanted to frame. 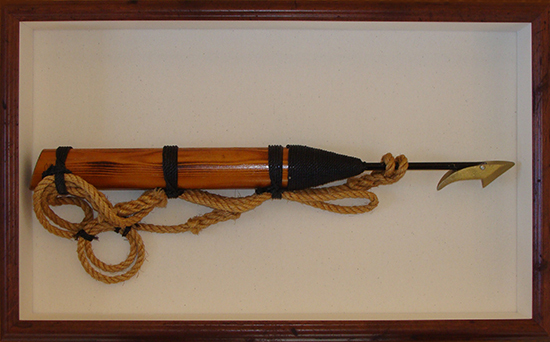 The frame needed to be deep enough to accommodate the harpoon that was about three inches in diameter, then we built up the sides with with a neutral color mat and carefully mounted the harpoon on the same neutral color mat for the backing. The overall effect really makes the harpoon stand out. We can make shadow boxes for any of your collectables. Come in for a consultation today! We created artwork on this mat to enhance a wedding invitation that we were framing as a wedding gift. 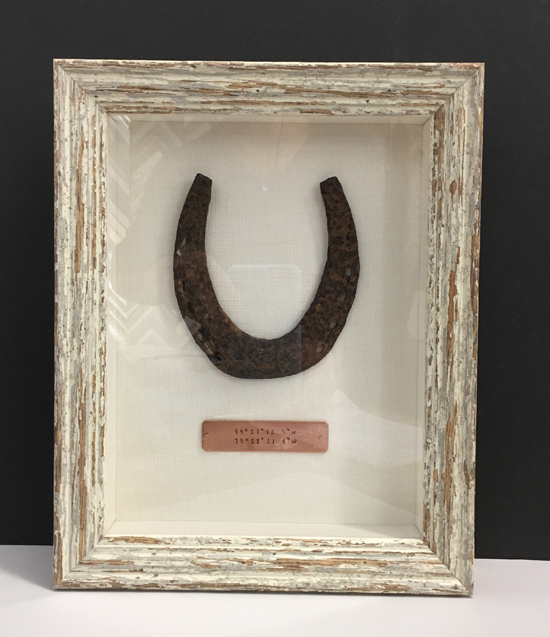 We mounted this very old horse shoe on a linen mat which added rich texture to complement the rusty shoe; the copper plaque added a finishing touch. 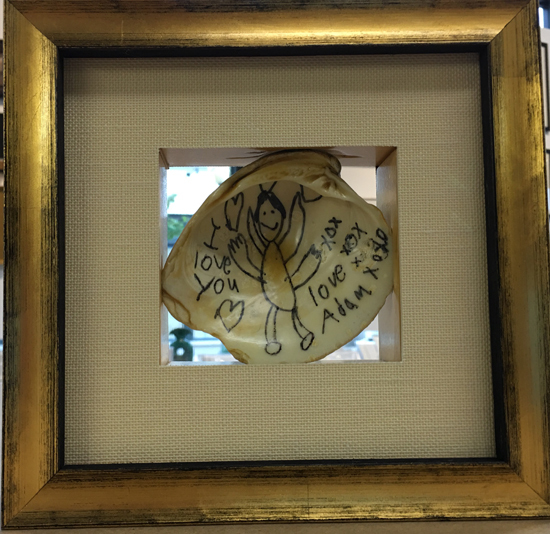 A grandchild wrote messages on both sides of a shell so we created a shadow box with glass on both front and back so that all sentiments could be appreciated. Big or small we frame it all! This was an interesting job. 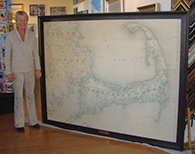 Our clients had a large space to fill and wanted this antique map. In order to have it as large as they wanted it was reproduced on canvas that we were then able to stretch, frame and add the brass plaque to. This piece of original art is a family heirloom. We used a 3 ½ inch wide ornate silver moulding with a black linen liner and silver fillet. All and all it's a very dramatic effect, lending to the importance of the piece. 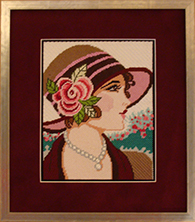 This piece of needlework was very dimensional so instead of merely double matting the piece we added a spacer between the top and bottom mat creating a shadow mat, so that not only did the mats compliment the piece, they added to the dimensionality of the piece and protected the needlework from being crushed by the glass. This was put together to remember a fallen hero. 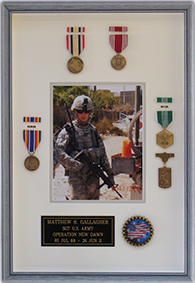 We can frame all your military heirlooms. 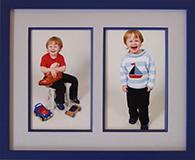 This bright frame and matching fillet is perfect for the youthful exuberance of the photographs and adds a sense of depth and prestige. The customer who made this whimsical needlepoint mermaid backgammon board used a deeper profile with plexiglass because she plans on using it to play backgammon.